For many who come to Mercy Housing, our services are not a hand out, but a hand up. 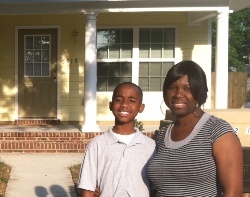 Falicia, a former resident of Heritage Corner Apartments in Savannah, Georgia never lost sight of her ultimate dream: having a home for herself and her little boy, Jacoby. Falicia and Jacoby moved to Heritage Corner Apartments in February of 2005 and immediately became involved with the various activities offered at the property. Whether it was the Continual Learning Summer Camp that took little Jacoby on adventures throughout his summer vacations, or the new money management skills Falicia gained through financial literacy courses — they both seized the opportunity for a better life when Mercy Housing offered it. The affordable rent at Heritage Corner allowed Falicia to improve her credit score and start saving money. She then enrolled in the Resident Services Resume Building Workshop, which helped her find a new job with a better pay. The staff referred Falicia to the Dream Makers program offered through the City of Savannah. This home buying assistance program offered by the City’s Housing Department provides different levels of affordable loans for down payment assistance, closing costs, gap financing and other related expenses. Falicia’s application was accepted and she completed the first-time home buyers classes. Then a few months laters, Falicia and Jacoby moved into their brand new home. For Mercy Housing, having a stable home opens the door to possibilities and allows our residents to dream big! We are thrilled that because of our programs and resources, the dream of homeownership became a reality for Falicia and Jacoby!